The first moose I ever shot was a yearling bull weighing approximately 500 pounds with a 32” antler spread in September 1962 in Steel Creek road area near Fairbanks, Alaska. In those days, the season ran from early August through the end of November. One bull was the legal limit. I was a non-resident at that time, definitely a greenhorn [cheechako-term meaning new to Alaska]. I did not realize at that time that even though this was the largest animal I had ever hunted, I would later learn that a full-grown adult bull would have dwarfed this first moose of mine. Years to come would educate me of the immense size of a bull moose. If I thought this yearling was large, I would have been completely blown away at the size of a mature bull. Alaska-Yukon moose are the largest member of the deer family. 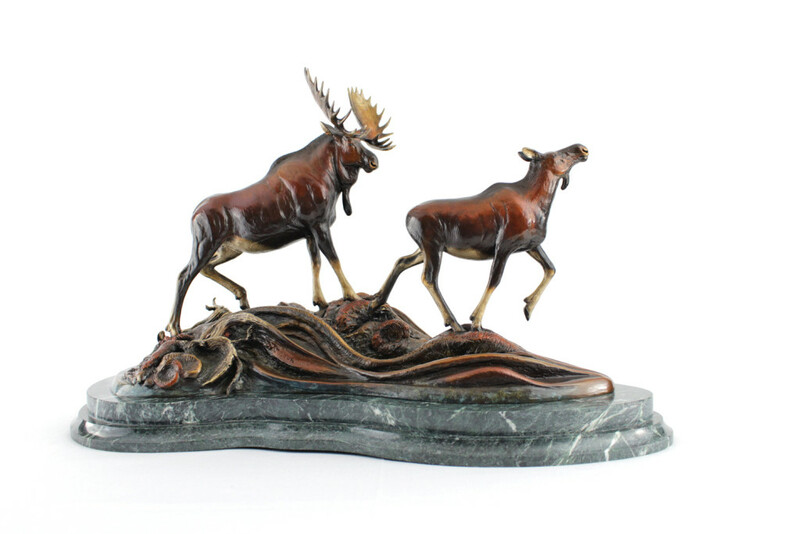 “Alces alces” is it’s Latin name. The meaning is eater of twigs. Dinigi is it’s local native Athabascan name from the Mentasta area where I have lived nearly since 1977. The moose inhabits most all of Alaska except extreme southeastern, western Aleutians, & northern Arctic edges of the state. In North America their range extends into Yukon Territory Canada while other sub-species continue south throughout Canada & into northern United States. Also, their range extends in parts of Europe and large portions of Asia. 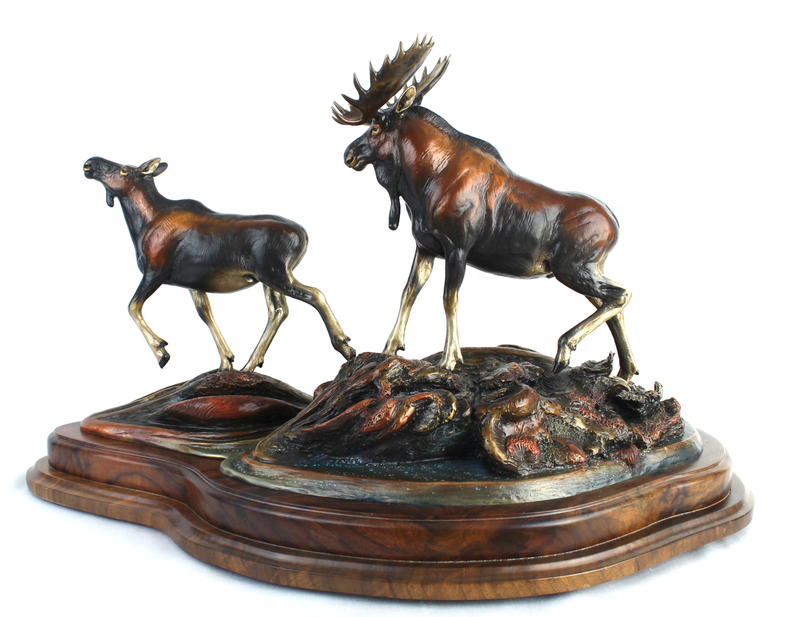 Prized for their meat, moose are one of the most sought after game animals by humans. Few other critters contain such a large amount of delicious, nutritious, & down right good eating meat than a moose. Bull moose, because of their shear size, sport huge antlers to match their body. A lucky hunter not only obtains hundreds of pounds of choice protein but also acquires an outstanding set of antlers when harvesting an adult bull. I believe that because of their value as a food source, their large distribution, and their ability to co-exist with people even in towns and cities, makes moose the most well know wild animal in Alaska. 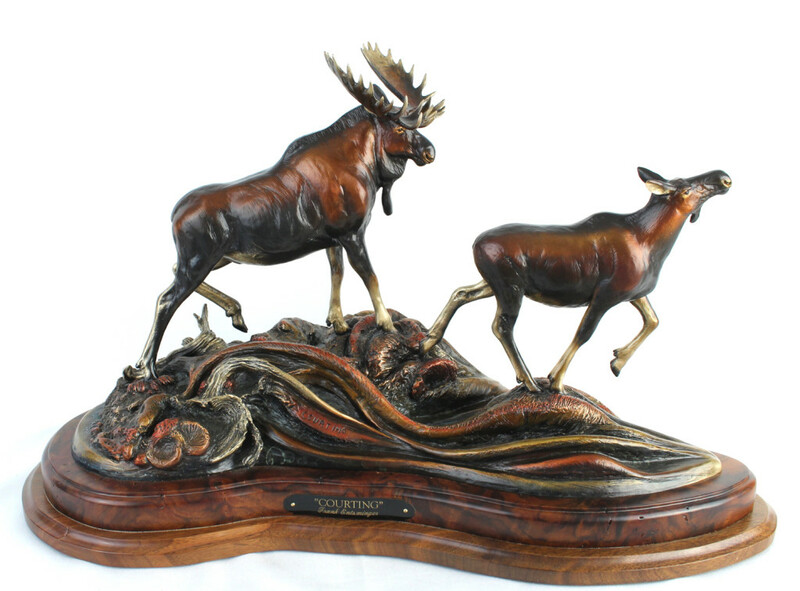 Courting is my 4th piece of bronze art dedicated to this impressive Alaskan icon. I see the moose as a beautiful work of nature adapted to its harsh environment. For me, moose are outstanding, awesome, and magnificently beautiful in every way. Having lived with and among them for over 50 years, they have earned my ultimate respect. Their ears are like radar. For their immense size, their long legs not only have the ability to handle deep snow, they can slosh through deep bogs or swamps, & swim deep lakes or rivers. They have the ability to adapt to living & feeding in high alpine ridges and meadows or down to lakes, ponds, and swamps of the low lands. I am amazed how they can move into populated areas turning to the scrubs, gardens & trees of humans to make their home. I cannot help myself from expressing my tribute to the world’s largest deer through my art. As a hunter, I spend every fall in the great wilderness of Alaska where no matter what I am hunting, be it sheep, caribou, bears, or goats, I inevitably run into moose. I enjoy hunting moose in September, which is the time to experience the rutting or mating season. I thoroughly enjoy watching a herd bull chasing his cows into his pod making sure they remain with him. This is a familiar sight to hunters & wildlife enthusiasts in Alaska fall time. This display of aggression has given me the idea for “Courting,” a dominant bull with one of his cows during the rut. I believe with sound game management of both predator and prey, the future of moose is assured for future generations to utilize, view & enjoy. Cost with a granite base.